Our final project is natural form mapping we called it as 'Bioluminescent' and it will be exhibited at our final class works exhibition. 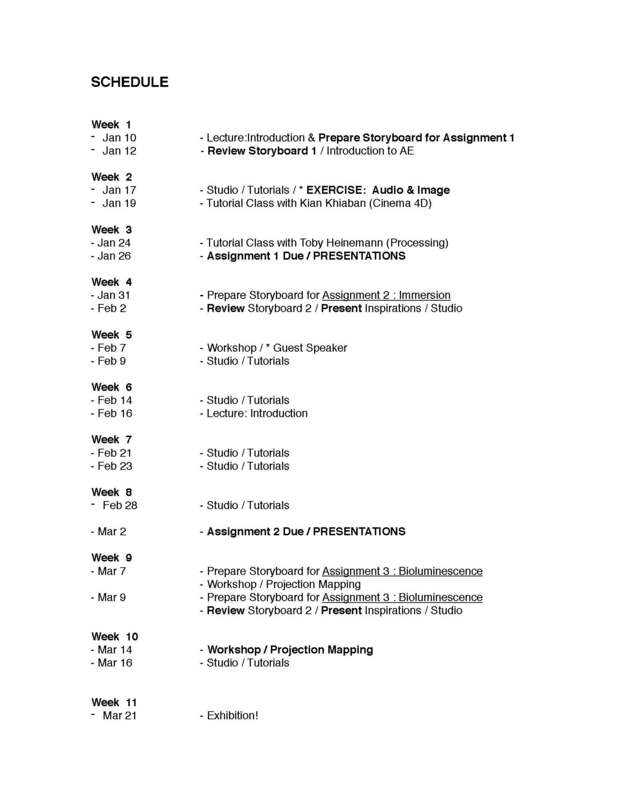 Final project is due on 18th of March. So we can use that weekend to open our exhibition on 21st of March. -Create a 60-second projection mapped animation, with audio onto a sculptural form. -Processes for creating this assignment will be explored in class. -Find one or two short videos that you think are good examples of the use of Immersive Room. -Come up with concepts, words or a phrase to be animated. -Create a background by using one (or more) photographs or create your own graphic or illustrated background image. -Design a storyboard for a 30-60 second animantion where the movement/behavior of the type and the audio complements and enhances the meaning of the word or phrase. -Create a 30-60 second animated video and audio. Bring a image file and idea to use for the immersive projection. You can find the templete files in the cloud server. EDA Floor Plan : you can check the phisical measure here. Use just two shapes: a circle and a line/rectangle. Design a storyboard for a 30 second animation in which one or more circles and lines express their behaviour and interact with each other at some point. In 6-8 drawings show the key points that describe the piece. Create a 30 second animated video based on the storyboard.